This Auction is for a Copeland Spode Italian plate. It is in perfect condition with no damage. Good colour. 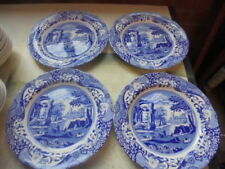 It is 9 inches in size.Blue oval on the back with Copeland Spode Italian on it. Free Wall hanging spring included. From the Spode Italian range a beautiful Oil & Vinegar Bottles and tray. SPODE BLUE & WHITE ITALIAN. Maker's mark:SPODE DESIGN Italian Made in England. Date: 2000 - to date. Spode Blue Italian Cafetierre. Condition is Used. Dispatched with Royal Mail 2nd Class. Pristine condition as kept in display cabinet. Happy for collection in person. Please see my other items. Spode blue and white italian jug and basin in perfect condition. Spode blue and white italian jug and basin in perfect condition.. Condition is Used. Dispatched with Royal Mail 2nd Class. Spode Italian dish, diamond shaped 23cm by 14cm..
Large planter. Blue Italian. We fully understand that things can go wrong for a variety of reasons. Laura Ashley Blue And White Serving Plate. Condition is Used. Dispatched with Royal Mail 2nd Class. Cut off corners. Size 13” by 10”. SPODE BLUE ROOM FLORAL 10" DINNER PLATE FLORAL. Condition is as new, used for display only. If you are using a tablet or mobile please select "Full Description". It is transfer printed with a rural scene. It has the earlier 20th century blue backstamp. Pair of beautiful Spode dishes Filigree pattern Both in excellent condition No box Dispatched with Royal Mail 2nd Class. These 15 cm spoons have never been out of their box. Spode blue & white Spice pots. They are transfer printed with a rural Italian scene. It is a largish cup. This is a Limited edition item that was available to Spode members only. Blue & White Italian cup & saucer plaque. Excellent condition as has only ever been displayed in a cabinet. measures 10x 6 x 4.5 cm A genuine bargain - selling most of my collection due to downsizing house move. SPODE BLUE ROOM WILLOW10" DINNER PLATE. Condition is as new, used for display only. Spode blue & white Cheese Dish. Condition is Used. Transfer printed in blue and white. Animals include deer, dog, rabbit, cockered, zebra, duck, cat. Condition is good. Probably Victorian as It is a family piece, great grand parents lived and worked in the Potteries. This is a very nice early 20th century preserve pot and cover by Spode in their popular Blue Italian pattern. It is transfer printed and has the earlier blue backstamp. Antique Copeland Spode Blue Italian Teapot, Old Blue Stamp, Very Collectible. This is a fairly large teapot I’d say possibly 2 litres. There is hairline crack to the base as seen in the pictures, but it hold liquids and does not leak. It’s roughly 9 inches from handle to spout and roughly 5 inches from the top of the lid to the base. Single cup no saucer in very good condition. SPODE BLUE ROOM GIRL AT WELL10" DINNER PLATE. Condition is as new, used for display only. SPODE BLUE ROOM BOTANICAL 10" DINNER PLATE. Condition is as new, used for display only. It is transfer printed and has the later 20th century backstamp. In excellent condition. Item: This sale is for a cereal bowl in the blue & white Spode's Italian, made in England by Copeland Spode. Copeland Spode's Italian. Size: 19cm dia. They are transfer printed with a rural scene. They have the earlier 20th century blue backstamp. 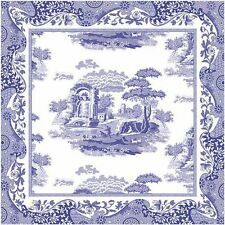 Spode's Italian design. Spode still making this pattern although not this particular shape. Length: Handle to spout 22cms. Large ceramic plant pot. The small print! but worth reading to avoid any misunderstanding. (Spode porcelain four slice toast rack. With the attractive and popular Italian Design pattern. International: Signed-for, or Airsure, where available). THE SET COMPRISES 1 TEA CUP, 1 SAUCER AND 1 TEA PLATE. Spode Blue Italian Imperial Cookware Pudding Bowl. 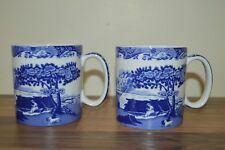 Lovely Spode Italian design blue & white cup & saucer. Excellent condition. Spode Italian Dinner Plate 26.5cm. Excellent condition. Rare Spode Porcelain - "PAIR OF MINIATURE SHOES" - Perfect - Beautiful. Antique Copeland Spode (1875-90) Imari Highly Gilded Plate Gadrooned Rim 9 1/2"